In light of Martin Luther King Day, we take the time to reflect on the efforts of not only Martin Luther King Jr., but also the others who stood at the forefront to fight for civil rights in America. I once stood in front of San Francisco State University’s Filipino mural (pictured above). 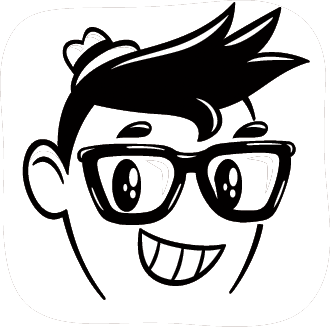 As a freshman still full of curiosity and bewilderment, I took in every detail possible. While questioning who the people in the mural were and why they were there, one detail in particular resonated with me. There was a quote in the corner painted in bold red, “We stand on their shoulders.” That brought the piece full circle for me, and suddenly I was filled with gratitude. The Civil Rights Movement was not just of King’s doing, but a coalition of thousands of local movements, including efforts made by Asian American activists. The Civil Rights Movement brought to light the racial disparities in America and demanded equal representation. People of color were ultimately fighting against marginalization and misrepresentation in institutions, the denial of basic human rights, and were standing against a system that consistently silenced their voices. In honor of their efforts, here are some of the Asian American leaders who were crucial during this pivotal time in America. By the age of 3, Richard Aoki and his family were victimized by racism during WWII when they were sent to a Japanese internment camp in Utah. That early experience was key to his understanding of mistreatment made by the US government. This, lead him to join and aid the Black Panther Party (despite his conflicting work as a FBI insider). She was most noted for her friendship with Malcolm X, and making him see that the Black Power movement wasn’t just an African American struggle but a multi-ethnic struggle. One of Audrey’s Women of Influence, Grace Lee Boggs made strides in the Black Power Movement alongside her husband, James Boggs. She was involved in the African American Movement for more than 70 years. 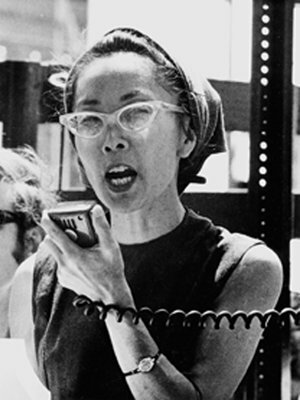 A Chinese American woman who pre-dated both the Asian American movement and second-wave Women’s Movement concerned with gender inequality, Boggs’ first experience with activism came when she got involved with protests in the black communities of Chicago over rat-infested housing. The Filipino American advocate for agricultural workers’ rights, Larry Itliong was a key leader in the Delano Grape Strike together with Caesar Chavez (seen above). However, his efforts for demanding better pay and treatment for laborers are often overlooked. “In popular culture, it’s seen as a Chicano movement, not as the multi-ethnic alliance that it actually was,” says Dawn Bohulano Mabalon–a history professor at San Francisco State University and author of Little Manila is in the Heart. Intercollegiate Chinese for Social Action (ICSA), Pilipino American Collegiate Endeavor (PACE) and Asian American Political Alliance (AAPA) were the Asian American unions that were part of the collective coalition of student unions called the “Third World Liberation Front.” These students fought a year long battle against the marginalization of a Eurocentric education, and were successful when the first College of Ethnic Studies was established at San Francisco State University. This is a battle that continues to inspire the oncoming generations as both Los Angeles and San Francisco are now institutionalizing Ethnic Studies in high schools. In what was once the “Manilatown” of San Francisco, there stood the International Hotel (I-Hotel), a hub and a home not only for WWII veterans who were legally denied land, but also for low income families who could only afford single room occupancies. During the city’s first attempt to demolish the building in order to make a parking structure, many Bay Area student organizations, neighboring Chinatown organizations and community leaders stood in solidarity to create human blockade around the building. But during the second eviction, authorities were successful at violently removing the elderly residents, which is seen in the documentary Fall of the I-Hotel. It wasn’t until decades after that the community’s efforts to rebuild the I-Hotel paid off in 2005 when the new I-Hotel was opened. 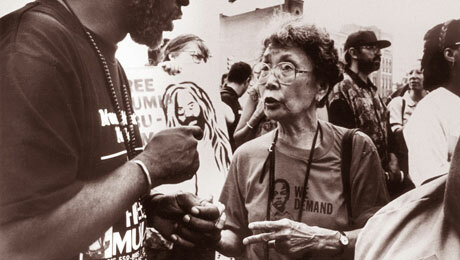 Pioneering Japanese-American activist Yuri Kochiyama passed away on June 1st. She was 93 years old. For some, she’s known as the woman who cradled Malcolm X as he lay dying on stage at the Audubon Ballroom in 1965 (“I just picked up his head and put it in my lap,” she recounted in a 2008 interview with Democracy Now! “I said, “Please, Malcolm! Please, Malcolm! Stay alive!”). But even that iconic image of her doesn’t do enough to capture the life she spent dedicated to social activism. Kochiyama’s journey began with her family’s internment during World War II and wound its way through the Black Power and Black Arts Movements of the 1970s. She was instrumental in helping Japanese-Americans win reparations for their internment, and spent the last years of her life inspiring countless young activists. She embodied the multiracial spirit of racial justice, and while there are plenty of tributes — like this song from Seattle-based hip-hop group Blue Scholars, or this heartfelt essay from Kochiyama’s granddaughter, Maya, or actress Sandra Oh’s performance of her speech on her internment — what’s most instructive is to listen to what she had to say about her own life. “The brief friendship of Malcolm X and Yuri Kochiyama began close to 50 years ago with a handshake.